After a long day at work you need to relax instead of cleaning. If you think so, you may like to give the job to Kyoho’s remote control cleaning brush. 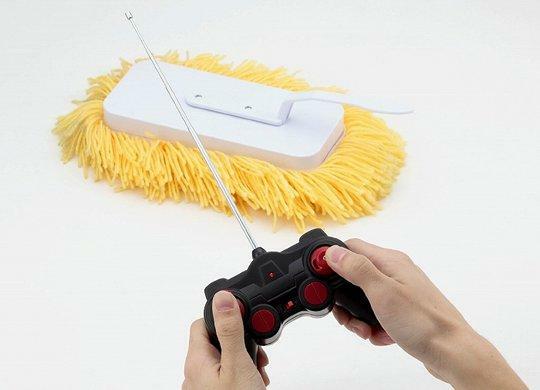 RC Sugoi Mop is an interesting remote control toy that measures 8.7 x 3.9 x 1.6 inches. As we can see from the images, the RC toy is shaped as a practical cleaning brush, and comes with a remote control that allows you to remotely control the cleaning brush in order that you can effortlessly clean your desk and floor. All you need to do is just enjoy the fun of the remote control, moreover, using the attached handle you can also use the cleaning brush to clean by yourself. Apart from that, the remote control cleaning brush is powered by 4 AA batteries, and the remote needs 2 AA batteries. The remote control cleaning brush is priced at $30 USD. If you’re interested, jump to Japan Trend Shop for more details or check out the following demo video first. Additionally, also don’t miss the remote control trash can.